Many women shy away from weight lifting for fear that it will make them too “bulky” or “manly-looking. Instead, they spend hours jogging on the treadmill machine, hoping that steady-state cardio will help them lose weight and get fit. While cardio certainly does have its place in a well-rounded fitness regimen, we’re here to tell you there’s a better way. Many experts now agree that weight lifting for women has many health benefits, from slimming down to increasing your longevity. According to a study published in Obesity, strength training is better at helping people lose belly fat compared with cardio. 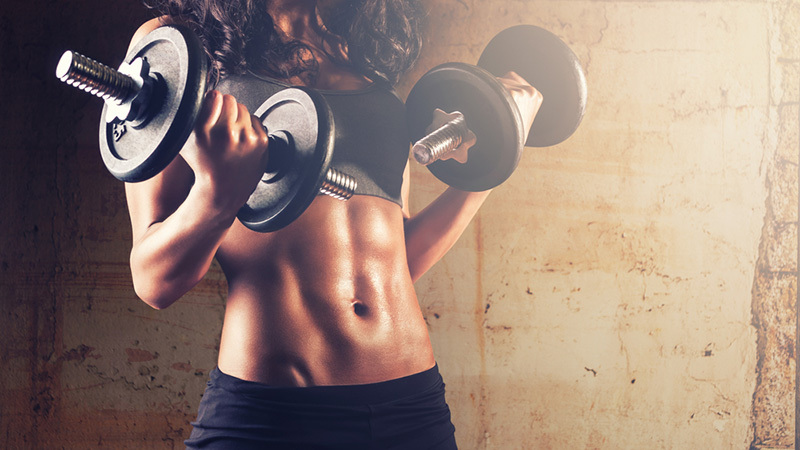 While aerobic exercise burns both fat and muscle, weight lifting burns almost exclusively fat while building muscle. That’s a winning combination when it comes to getting fit. Another reason to train with weights while trying to lose weight is that the more muscle mass your body has, the more efficient your metabolism gets. Muscle requires more energy to maintain than fat does, which means by adding more muscle to your body, you’ll burn more calories even at rest. Many people find that gaining physical strength makes them feel stronger in other aspects of their life as well. It’s empowering to know your body can do something now that was once impossible (isn’t it great when you can move boxes or carry your groceries all by yourself?) and this encourages mental strength, too. Strength training has a reputation for making women “bulk up” but in reality, this is not the case. Muscle weighs more than fat, but is much denser, so even if you technically gain weight on the scale, your dress size will likely go down and you’ll look far trimmer. Plus, most people don’t realize that it’s really, really difficult for most women to get bodybuilder huge. They simply don’t have the testosterone needed to get that big. If you feel like you’re bulking up from weight training, it could be that you’re simply over-eating after your workouts (rather than actually packing on pounds of muscle). Weightlifting not only increases muscle mass, but it increases bone density as well. This is especially important as we age, since our bones tend to weaken as we get older, leading to osteoporosis, breaks, fractures. Strong, dense bones are essential to maintaining optimal health and mobility. Last but not least, weightlifting can increase your self-confidence. You’ll notice within just a few weeks of lifting that you are getting stronger. Your posture will improve, which means you’ll be literally walking taller. There’s truly nothing sexier than a woman with strength and confidence, so go ahead and rock your killer new bod — you’ve earned it with all that hard work. Nice tips you have listed here, most women will see this as a very hard job you know. This is a great article. Thanks for sharing… of great help.